Hometown: I was born in the Bronx, New York, but have lived in seven different states. I’ve spent the majority of my life in Miami, Florida, though! How did you get your internship? I participated in the National Student Exchange program offered through FIU and attended the University of Hawaii at Manoa in the Fall of 2017. While I was living and studying in Hawaii, I also interned for Congresswoman Tulsi Gabbard. It was through meeting the congresswoman’s constituents in her district office that I realized the next step for me was Washington, D.C. At that time, I applied for the Congressional Hispanic Caucus Institute’s (CHCI) Spring Internship program and was selected as one of 20 people from across the country to come to D.C. and intern for a member of Congress. What did you do there? While interning in Sen. Schumer’s office I made sure to focus on work that would really give me a better understanding of what the constituents needed. I spent time speaking to people from across New York and the country about policy issues that were important to them. Aside from that, I attended legislative briefings and hearings and composed informational and concise memoranda for the senator’s legislative staff. What projects did you work on? I worked on a variety of projects ranging from responding to inquiries made by constituents regarding a certain topic to composing in-depth policy memos. Some of the policy areas that I wrote reports on were housing, technology, agriculture and the environment. How did your internship connect back to your coursework? Being able to take an in-depth look into so much of what I have touched on throughout my collegiate career as a student in the Steven J. Green School of International and Public Affairs was truly incredible. There is nothing like connecting the dots between academia and politics and then taking it a step further and analyzing how every decision affects people in the United States and across the world. What was the coolest thing about your internship or that happened during your internship? The coolest thing about my internship was having the opportunity to experience a new world alongside 19 other members of my intern cohort through CHCI. Living together, working together and being a support system for one-another was really incredible. CHCI brings together 20 members of the Latinx [gender-neutral form of Latino or Latina] community for this opportunity, and for many of us it was our first time entering these spaces. Being together allowed us to feel comfortable and empowered enough to really represent our communities on the Hill in a manner that we were and are really proud of. What did you enjoy the most about your experience? I really enjoyed exploring my passions in different areas of public policy and figuring out how I can be helpful in this day and age to create an America that we can all be proud of. Taking the time to sit down with mentors and colleagues to discuss their journeys to and from the Hill was helpful in figuring out my own next steps. I really enjoyed developing and growing into the best version of myself by staying true to my values and working hard. What did you learn about yourself? I learned that I belong in D.C. I learned that I, too, can do this. Being born in the Bronx and raised by a single mother, there were points where my family and I couldn’t even dream of a day that I would be living and working in D.C., but throughout my journey I constantly discovered how my upbringing was my greatest asset and that is something that I am really proud of. I learned that I had it in me to carry my family’s hopes for our country in a way that really highlighted why diversity on all levels and spectrums is necessary. What advice do you have for those beginning the internship process? While I’m still learning and growing myself, the best advice that I can offer to those beginning the internship process is to have an open mind and be curious. Be respectful, be kind, be curious, be diligent and be open to ideas or suggestions. How did the position increase your professional confidence? There is a saying that goes “You can’t be what you don’t see.” As a young man of color, it was apparent that the halls of Congress lacked diversity, and I had doubts about what my contributions, if any, would be. Throughout my journey, I learned that I was prepared for the occasion because of my experiences and began to realize that voices like mine were necessary at every table in every space. I was sure that I could serve as a voice for many who share similar life experiences in a way that promoted diversity and inclusion. I’m confident in my ability to perform at the highest level while remaining authentic to my identity that encompasses who I am, where I come from and where I want to go next. 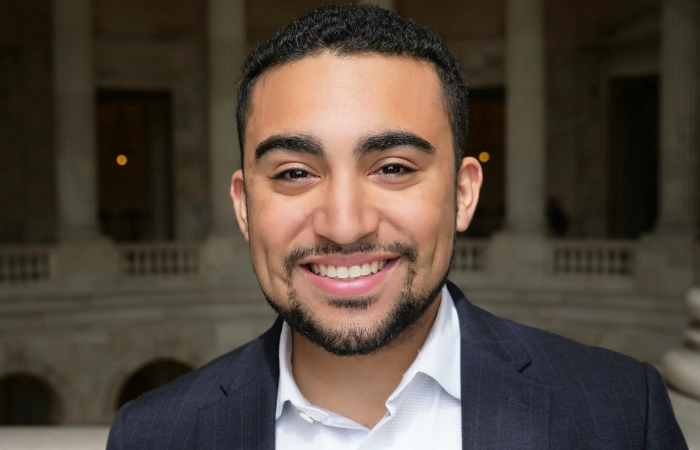 Frias is currently completing a fellowship at the Congressional Research Service in D.C. He plans to graduate from FIU at the end of this semester.